Stepping on the shore of Nusa Penida, perhaps you might wonder, “Where’s everything?” Nusa Penida is indeed a quiet island which is usually overlooked by the tourists. No crowded clubs and pubs, no waiters spreading brochures, no fire dancers. Boring? Nusa Penida is surrounded by a network of small roads which will take you circle the island. The best way to cruise Nusa Penida is using a motorbike. Bicycles are not advisable since there are many steep roads on the island. You can find motorbike rent in Toyapakeh or Sampalan on the north side of the island. However, renting a motorbike in Nusa Penida will cost you around IDR80,000-120,000 per day, much more expensive than if you rent a bike in the mainland (around IDR70,000 per day). Don’t forget to fill your bike with as much petrol you can find. Fortunately, there aren’t too many motor vehicles in Nusa Penida so you can wander aimlessly without worrying about the traffic situation. Some of the most beautiful beaches in Nusa Penida can only be visited after going through bumpy roads. It can take hours only to get to one of the beautiful beaches. However, Nusa Penida is not for making a score. It is for those who need to find a “bigger” place. Three of the most favorite beaches in Nusa Penida are Kelingking beach and Atuh beach on the west, and Atuh beach on the eastern side of the island. There are several beaches in which you are allowed to spread a tent and camp. 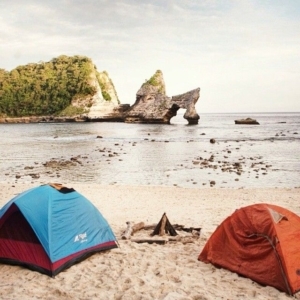 Spending a night in a tent in Nusa Penida, especially in the far corner of it, you’ll get a sense that you’re camping at the edge of the world. The most interesting thing about camping in Nusa Penida is there’s no cellular network. You can focus on your beloved person with whom you’re camping and on what lays in front of you. Disconnect to connect, people say. One of the most beautiful sites for camping is Atuh Beach. You’re gonna spread your tent on a narrow, secluded bay overseeing a small island which looks like a giant turtle with an oversized beak. The island is one of the most interesting places for scuba diving. Since there aren’t too many humans bothering the sea surrounding Nusa Penida, you can meet cool underwater creatures, namely manta ray, mola-mola or sunfish, white-tipped reef shark, nurse shark, hammerhead shark, sea turtles, etc. There are around a dozen dive spots in Nusa Penida, such as the famous Manta Point, Crystal Bay, Toyapakeh, Malibu Point, Vertigo Point, etc. To get the underwater experience, you can visit one of the dive centers located in the northern part of Nusa Penida. If you are not into scuba diving but you still want to have a peep of the underwater world, you can try snorkeling in Gamat Bay, Crystal Bay, or Manta Point. One of the most recommended spa resort in Nusa Penida is Coco Resort Penida. Located in a jungle near Crystal Bay, you’ll get an incredible, authentic spa experience in Nusa Penida. The tranquil ambiance of Nusa Penida is also suitable for practicing Yoga. You can go to one of the quiet beaches, spread your mattress, and locate your long-lost inner peace. Are you ready to experience Nusa Penida?